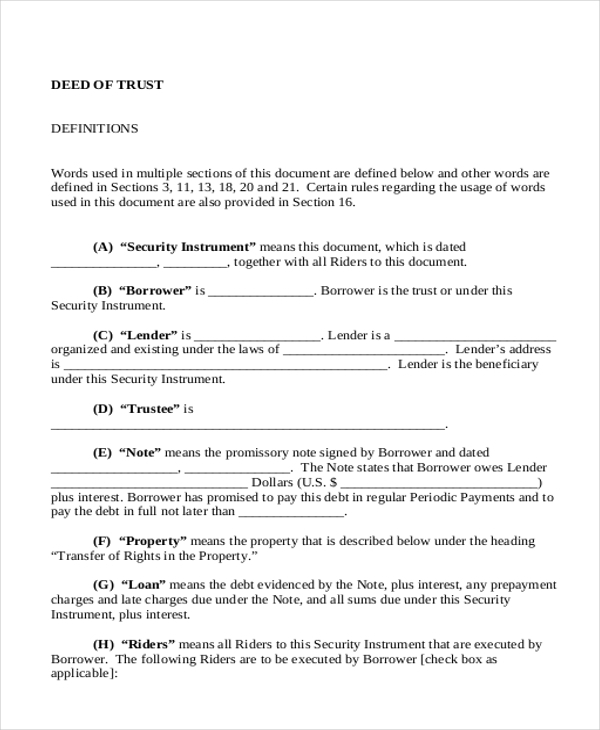 A deed can be described as a legal written document where one person (grantor) formally announces to convey title of his real property to some other individual, termed as grantee. In legal lingo, a deed is defined as an important instrument (signed by a notary) which contains contract or covenant delivered by a person who is legally bound to do so for the grantee. 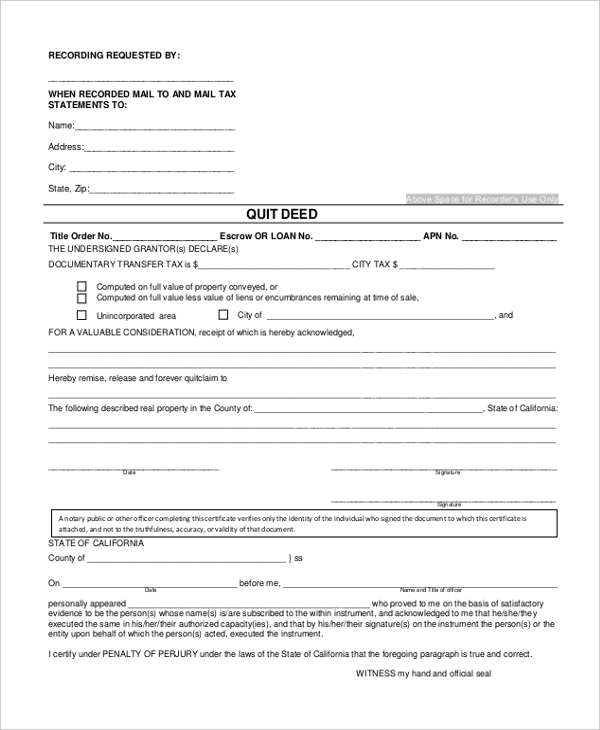 Are you looking for help for framing deed forms? Well, not to worry as there are pre-designed deed forms online to help you. You have a standard quit claim deed form which begins with recording requested followed by a time of recording, legal description and finally you have the acknowledgment of the notary. 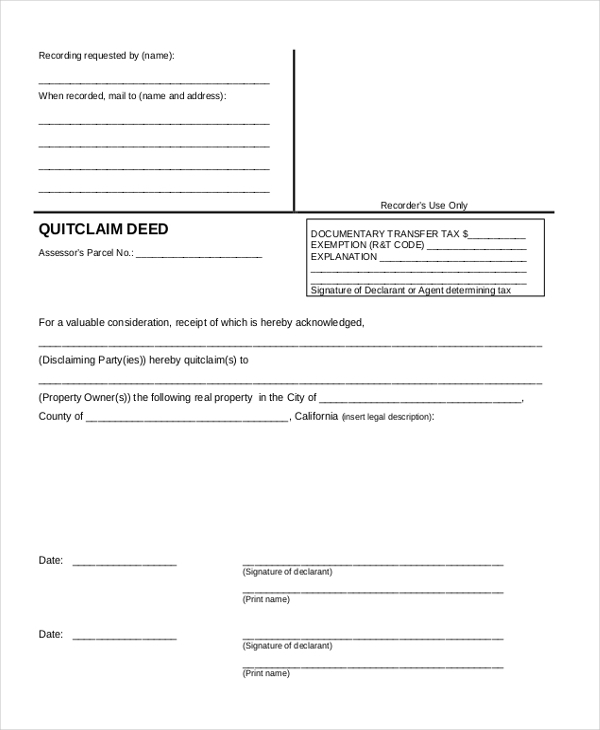 If you are looking for deed forms for a quitclaim deed, this is the form for you as it comes with all standard sections like title order, documentary transfer tax, description of real property etc. 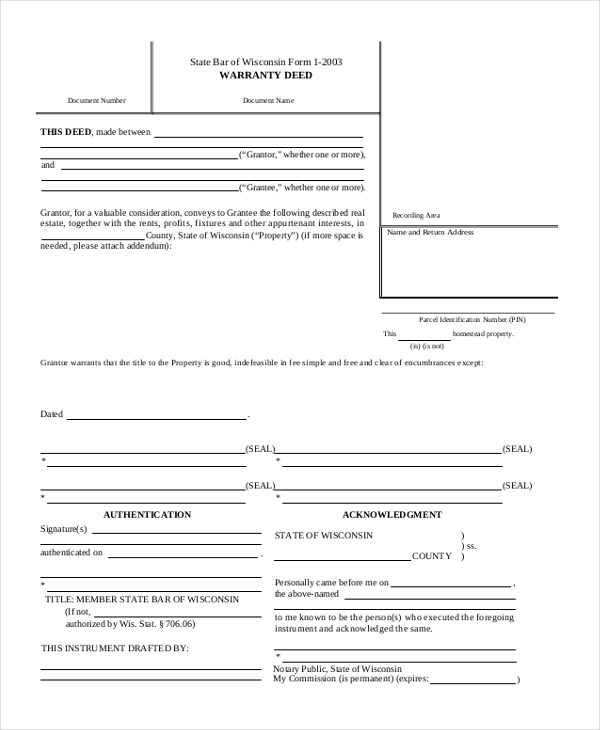 This warranty deed form begins with a declaration that a deed is being made between the grantor and the grantee and goes on to say what the grantor would convey to the grantee. If you are looking for a guide on all the important terms that used in deed forms, this sample here would be handy with its precise definition of the typical legal aspects you will find in such forms. 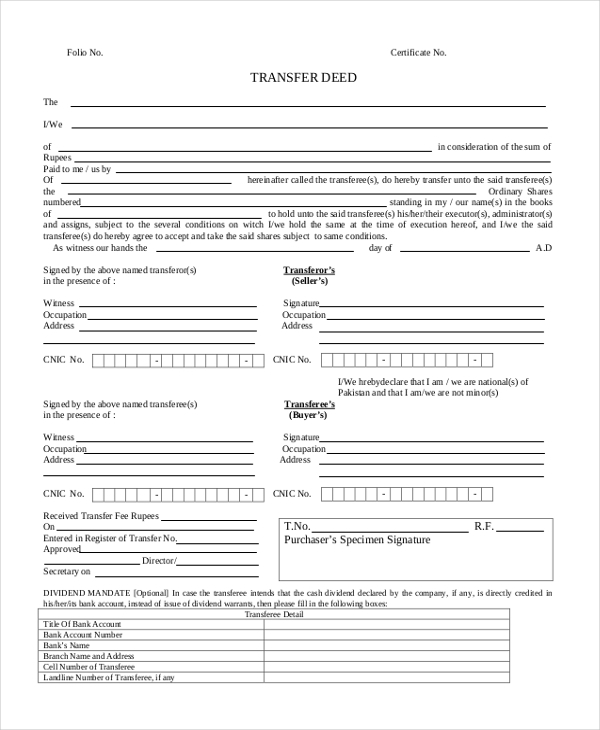 This deed transfer form begins with a declaration by the transferor that he is transferring the deed to a transferee and both the parties have to sign the form in presence of witnesses. You have a professional grant deed form here that opens up with details on the recording requested followed by APN, Documentary Transfer Tax and finally an acknowledgment by a law officer. 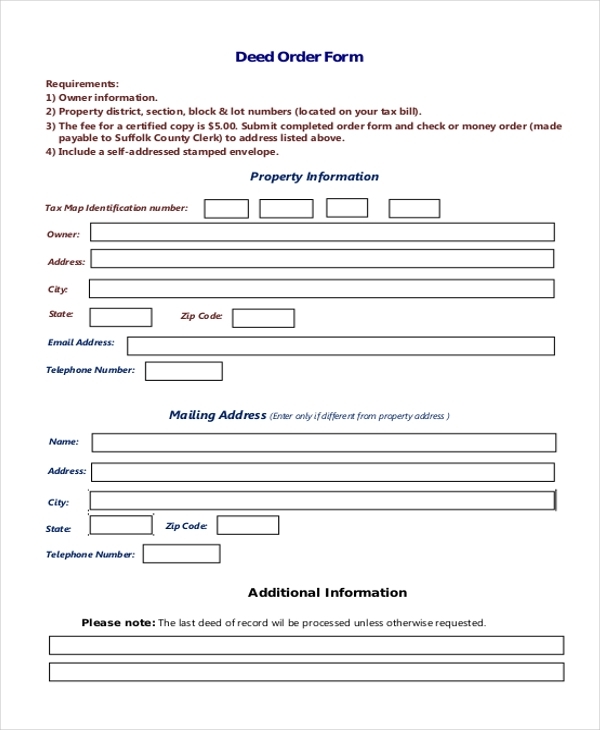 You have a very neat and smart deed order form here which comes with sections on all important aspects of such a form like requirements, property information, mailing address and so on. 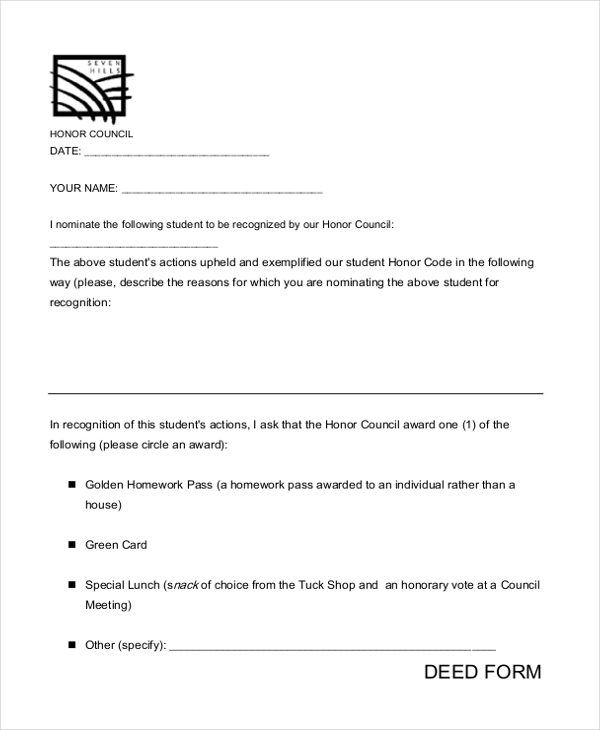 This is a good deed form which is meant to encourage students when they have performed an excellent job and the form allows the teacher to nominate such a student for a special honor. You have a contract for deed form here that starts with a note identifying the seller and purchaser and is followed by important sections like a declaration by the seller, purchase price, taxes and so on. You have city directory research form where you will start with the property address, followed by 6 sections on directory entry along with directory year as well as year published. 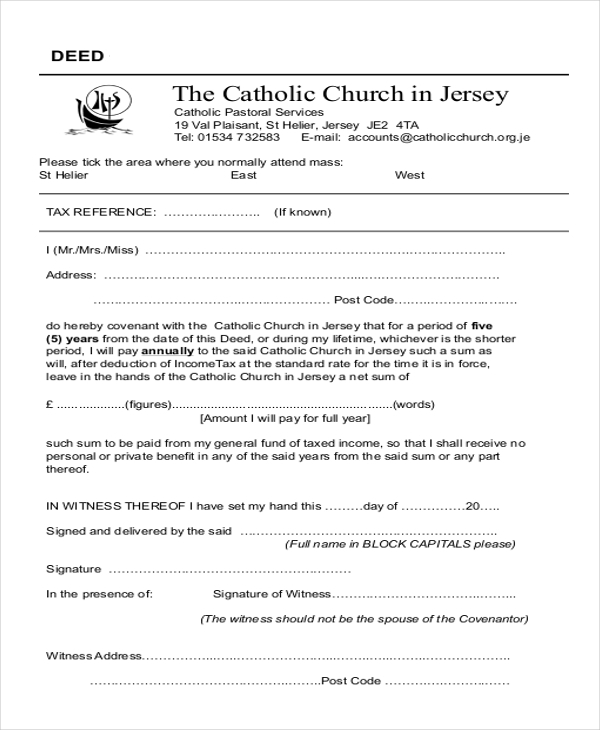 If you are looking for deed forms for a deed of covenant for your church, this form would be really handy as here the donator can officially declare about his annual donation to your church. 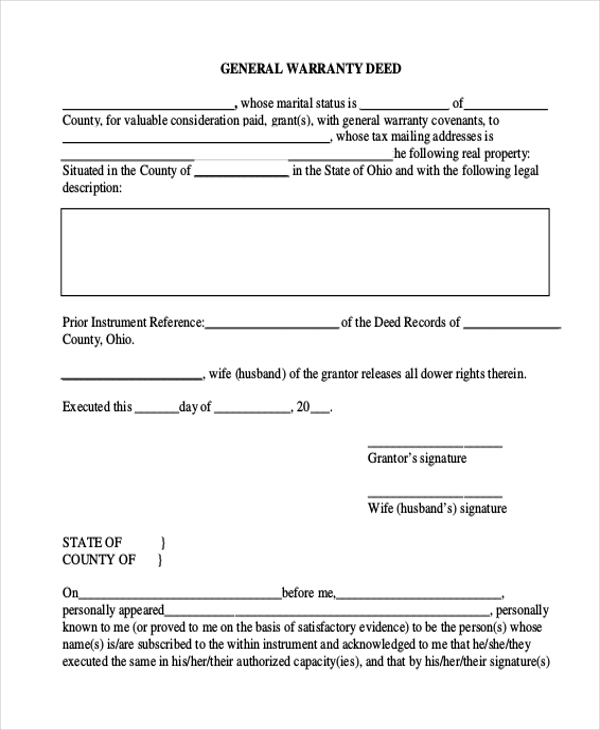 This special warranty deed form talks about the parcel and then goes on to identifying the grantor and the grantee and the agreement between them. It concludes with notary’s signature. 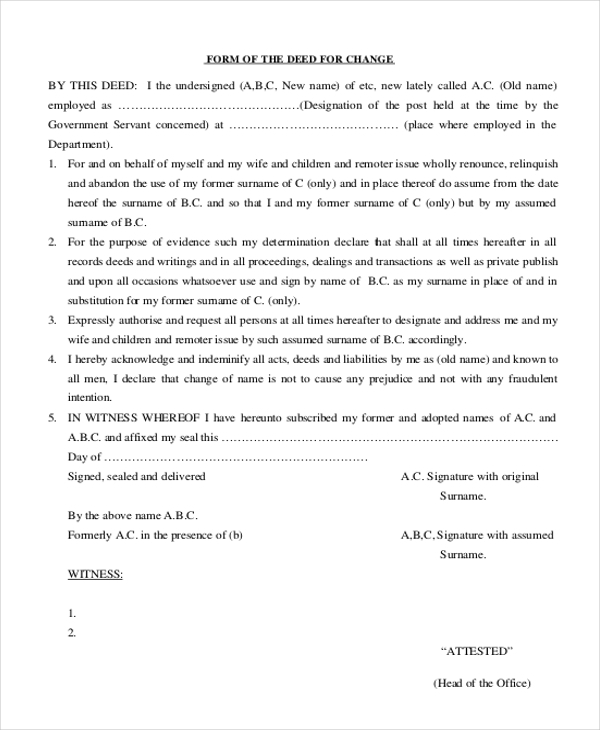 This deed form here would be useful when someone is looking for a deed form for the change of name. The form allows you to mention both your old and new names and that from now on you would want everybody to address you by the new name only. 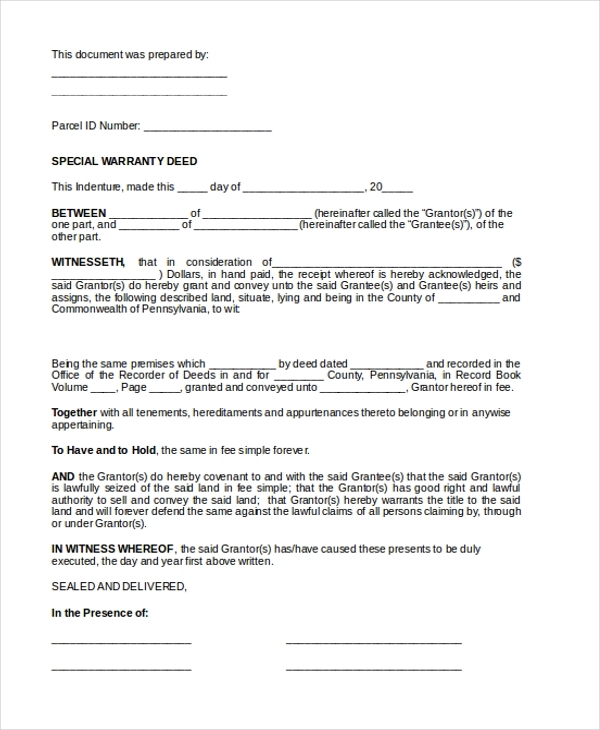 This warranty deed form opens up with a declaration by the grantor that he is granting the real property to another party. You are getting a sizeable space here to place property description. 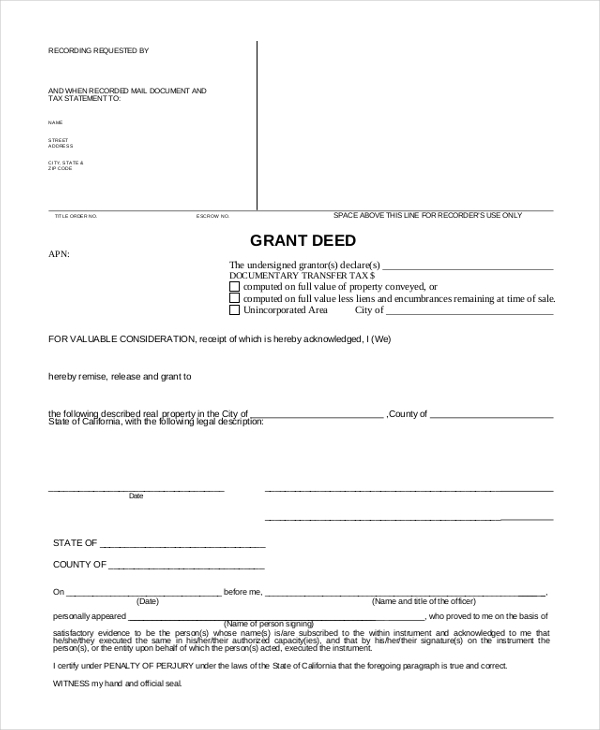 This mineral deed form talks about the agreement made between the grantor and the grantee which is followed by information of the sale, rights to be enjoyed by grantee and signature of the notary. What are The Different Types of Deed Forms? When it comes to deed forms, there are 3 basic types. The most popular one is Grant Deed where the conveyor declares that he is granting his property to a party, recognized as grantee. The other one is Quitclaim deed form. Such a form is used to pass title, claim or interest held by the grantor in his property to the grantee- but in this case, the grantor doesn’t make any representation regarding the validity of the title. 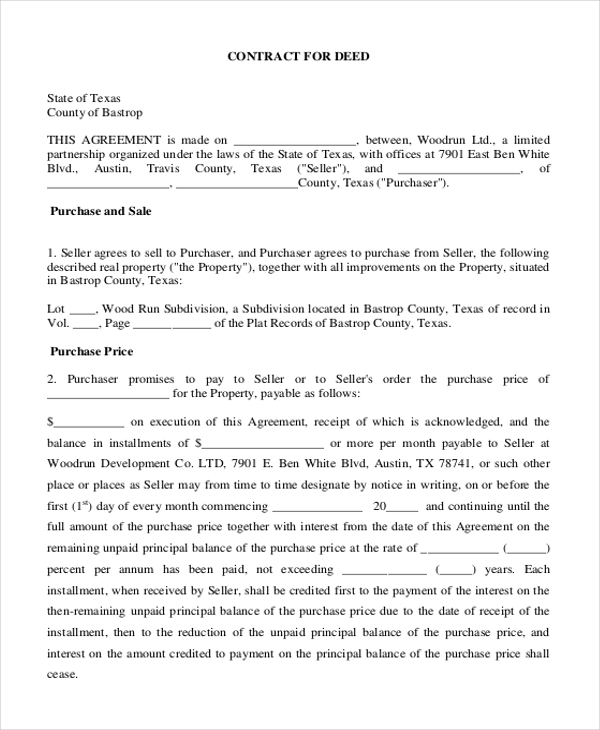 The third option is warranty deed form. With such deed forms, the grantor would insert the covenants for the title, assuring that the title is clear and good. 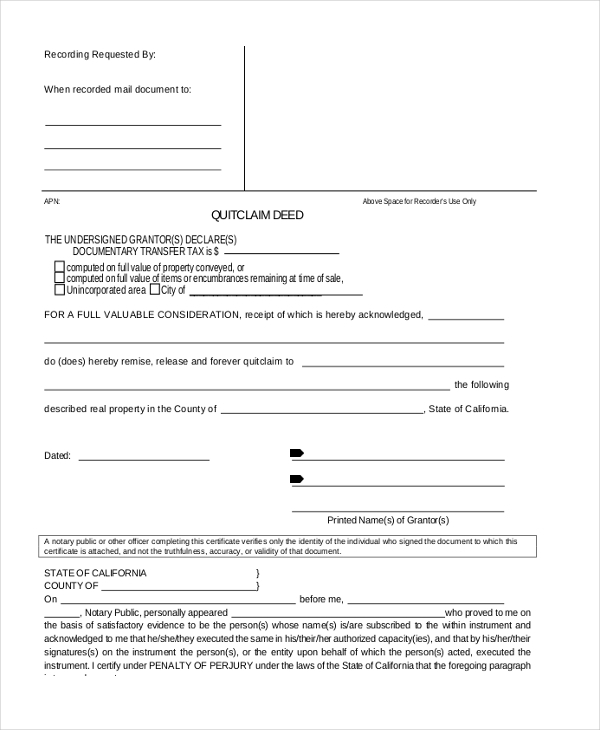 The deed forms are legally enforceable documents that are to be filled by a grantor when he wishes to formally grant his property to a party. 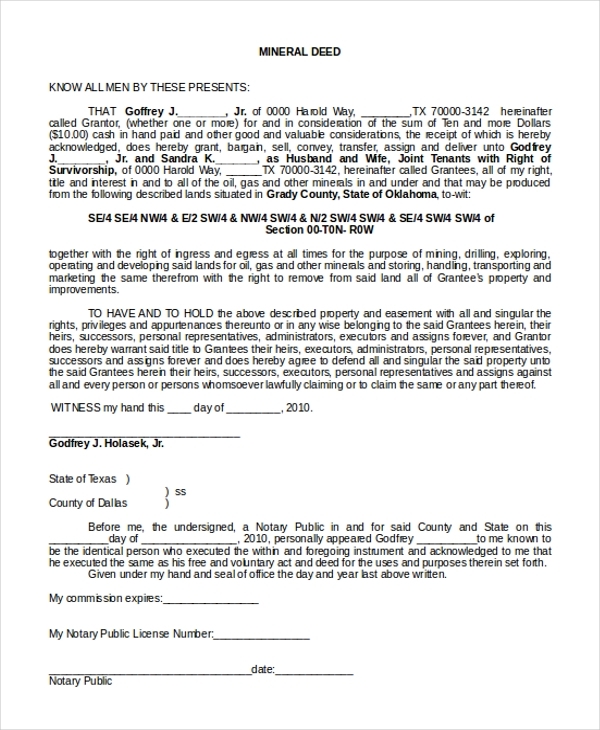 These forms are usually filled and signed in the presence of a notary. Thus, naturally, the notaries, the lawyers and law firms would require such deed forms. Then, the courts too need deed forms. Beside, deed forms are required by academic institutions when a teacher wants to recommend a student for the special honor for good deed. Churches require deed forms as well when a member wishes to make announcements on annual donations for the church. If you are looking for a standard structure on deed forms, the form samples mentioned above would be really helpful for you. All of them are drafted by experts and hence you can be assured of legit and most professional forms only. All the forms are customizable with your own data.